he exhibition Living! Photographs of Resilience – Vivre! Photographies de la résilience – is in line with the actions that the Dapper Foundation has been carrying out for many years to promote the arts of Africa and its diasporas, while initiating a new approach. Indeed, since 2012, this private non-profit and recognized public utility institution has organized several exhibitions on the island of Gorée (Senegal) that have met with great enthusiasm. The public was able to discover or rediscover the works of renowned artists including Soly Cissé, Joana Choumali and Bili Bidjocka. Since then, the Dapper Foundation has been approached by young artists who have sometimes never exhibited before. On the strength of this demand and eager to share new discoveries with its audience, the Dapper Foundation has launched a call for projects open to all – experienced photographers and young talents. More than 300 dossiers on the theme “Against all odds” proposed this year by Gorée – Regards sur Cours, an event in which Living! is presented, were studied by the exhibition curators. The work of 15 photographers living in Africa, Europe, the Caribbean or the Indian Ocean – Christian Barbé, Karim Barka, Philippe Gaubert, Moussa Kalapo, Fototala King Massassy, Ziad Naitaddi, Zacharie Ngnogue and Chantal Edie, Jarmo Pikkujämsä, Julie Robineau, Rolook, Saan, Zara Samiry, Hamed Traoré and Pierre Vanneste -, has been selected according to aesthetics criteria, of course, but also for the power of the messages carried by the proposed pictures. The exhibition Living! presents 34 photographs of resilience or the “art of navigating between torrents”. The incredible capacity of human beings to cope with a difficult situation is thus addressed in four sub-themes related to Africa and its diasporas: the Social approach, the Environment, Questioning and Exile. Through the prism of their objective, the selected artists question the contemporary world and its evolutions. They offer us, each in their own way while resonating with each other, a reading of today’s society that transcends borders. By choosing photography, the Foundation emphasizes a medium that allows the artist to tell the story of today’s world through an often committed approach. Economic and social disparities are becoming more and more significant in large cities. Each group has its own codes and constraints that shape individuals and determine their ways of thinking and acting. 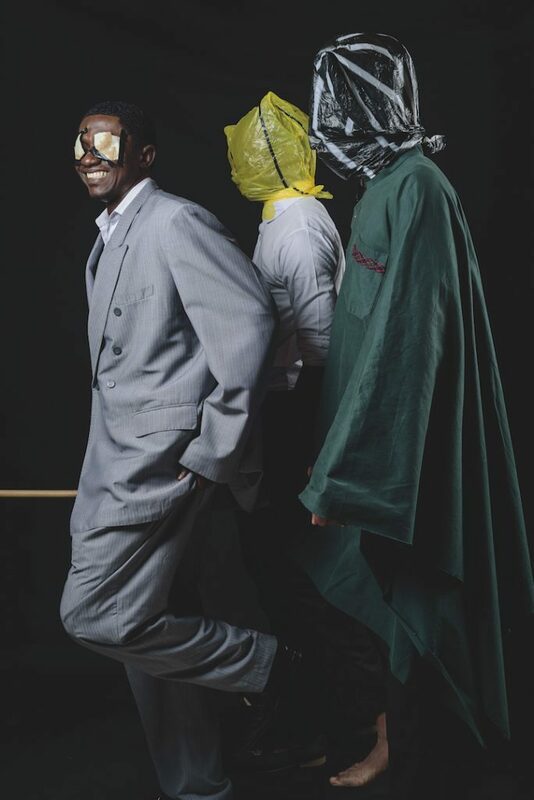 With his photographic composition “Productive Anarchy”, committed but not without humour, Fototala King Massassy highlights the incredible capacity for innovation and creativity of Africans. His colourful photographs present impressive accumulations – at first sight disorganized – of glasses, crates or even televisions to highlight the concepts of resourcefulness and organized in- formalism so characteristic of the African continent. The photographer’s message is clear: Africa must use its assets, which are and will be the elements of its success, to emancipate itself from the great world powers. 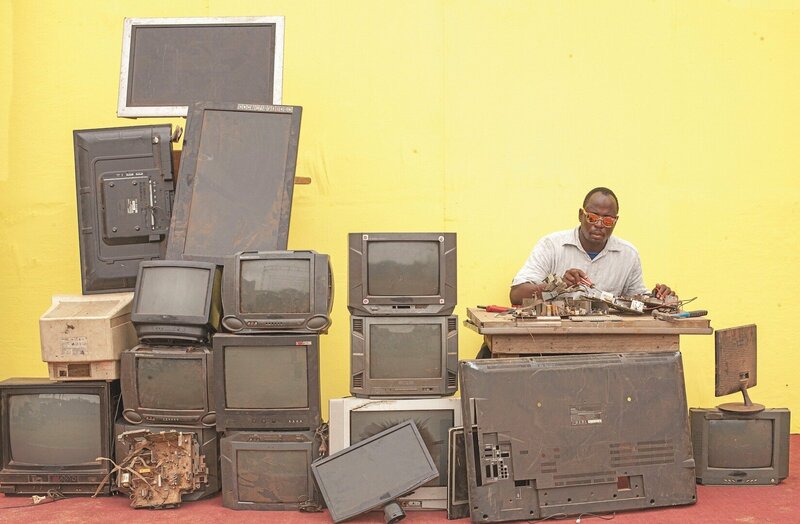 Born in 1971 in Côte d’Ivoire, Fototala King Massassy is a Malian artist with an abundant production. A rap singer, actor and self-taught photographer, he is unclassifiable. Initially an amateur, Fototala King Massassy began taking photographs in 2007 and made it one of her main professional activities in 2015. He quickly exhibited in Mali, for the Bamako Biennale, then in France. Through the portraits of his everyday heroes, Fototala King Massassy talks about Africa, which he wants to see “know and love” and intends to “show how dynamic, inventive and fertile Africa is”. A social approach. The informal world. 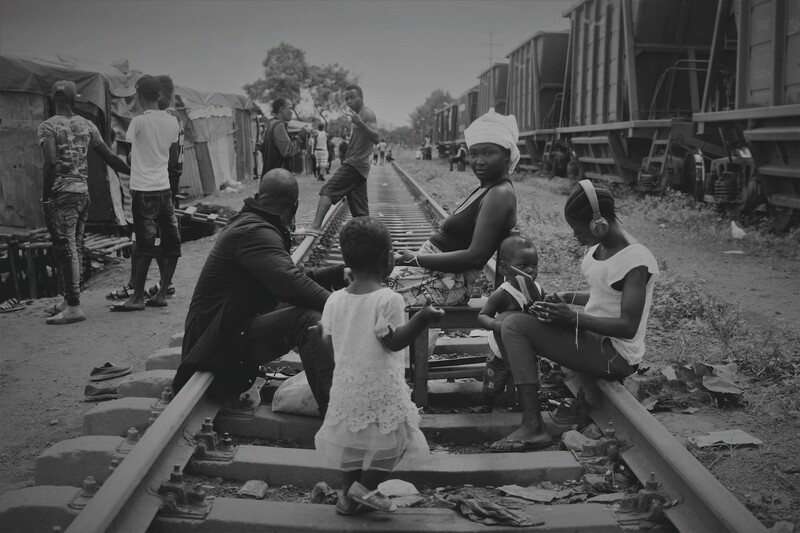 In Amzalazala, the slum located in the heart of Conakry, the capital of Guinea, people live to the rhythm of the train passages announced by the shrieking horn. Hamed Traoré’s art plays with contrasts of light and gives us the impression of watching a sequence of a black and white film. Even if the ground is littered with various types of waste, no form of misery can be seen in this photograph, which highlights the dignity of the inhabitants. Mohamed Traoré known as “Hamed Traoré” was born in Burkina Faso. He started working as a welder. Since 2006, he has lived in Bamako (Mali). When war broke out in 2013 in the north of the country, the young man accompanied reporters of great international media. 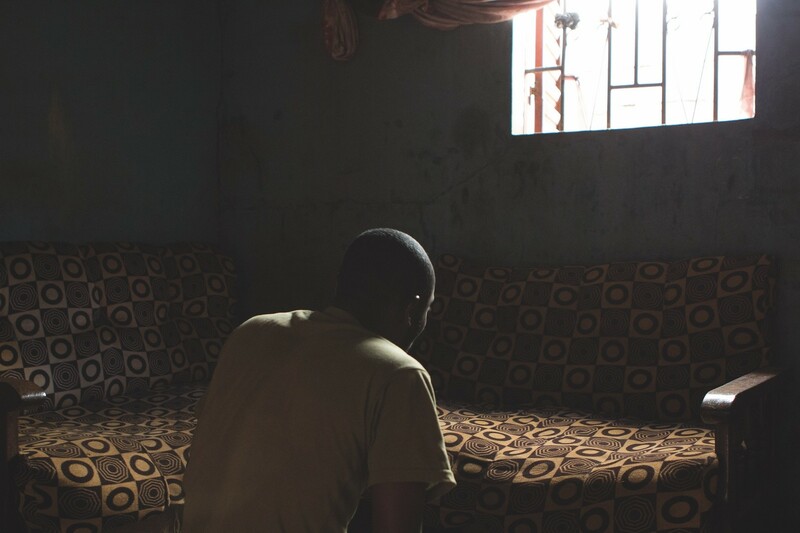 His first photo essay, produced in 2015, focuses on the “madmen” who, in general, are not locked up in Africa. Three years later, the artist turned his attention to a small town in northern Congo, and the same year, he captured the life of a slum in Conakry (Guinea). Series « My Taboo Child », 2015 © Zara Samiry. A social approach. Woman under the eyes of others. Zara Samiry photographs with a certain empathy those whom we do not know, to whom we do not necessarily pay attention, and who nevertheless compose the face of the Moroccan society. Through her series “My Taboo Child”, Zara Samiry tells the story of women linked by a common event: the arrival of a child out of the marriage. 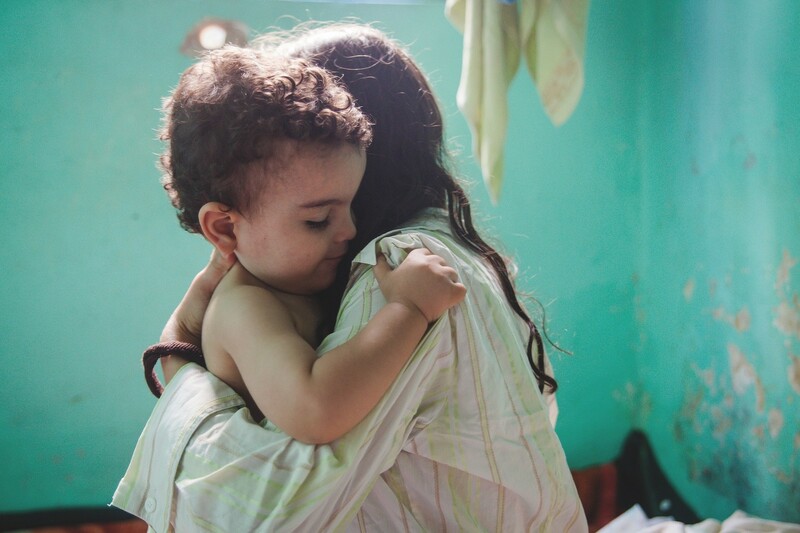 This birth disrupts their lives at all levels and places them at the margins of society. The photographs selected by the Dapper Foundation share with modesty moments of deep intimacy of these single-parent families. Zara Samiry is a Moroccan photographer who lives and works between Paris and Casablanca. The artist began his professional career in advertising, then entered the École supérieure d’art et de design d’Orléans and graduated in 2010. Since then, she has been involved with in several exhibitions in France and abroad. In addition to her main vocation, Zara Samiry is also an author. Specialized in documentary portraiture, she combines image and narrative to tell the daily life and illustrate the intimate. © Zacharie Ngnogue and Chantal Edie. A social approach. For a social and political peace. Since 2017, Cameroon, a country with two official languages, has been under high tension. The dialogue is extremely tense between the French-speaking community to which Zacharie Ngnogue belongs and the English-speaking community from which her partner, Chantal Edie, comes. This photograph taken by the couple is a kind of advocacy for freedom, the absence of which is symbolized by the eyes hidden by pieces of adhesive and the heads trapped in plastic bags. The relatively tight framing process produces an impression of movement. Men move forward together side by side. Zacharie Ngnogue was born in 1981 in Bandjoun, Cameroon. As a child, he moved to Douala, the capital of Cameroon, where he discovered photography. In 2006, he trained as a computer graphics designer and then worked for agencies. The artist is the winner of the Wiki Loves Monuments competition in 2013. The same year, he created the XL studio where he worked with his life partner Chantal Edie, who he met in 2015. Chantal Edie was born in 1981 in Banguem, Cameroon. She holds a Master’s degree in Political Science, a Bachelor’s degree in History and a Higher Education Diploma (HND) in Health Sciences. She developed her photographic skills in Southampton, England. Together, Zacharie Ngnogue and Chantal Edie question their personal and common experiences to look at society. They have participated in several group exhibitions. Facing the movements of rural populations to metropolitan areas, climate problems and the management of their natural resources, States must face major environmental issues. Looking for the rare pearl. Series « Les décharges d’Andralanitra », 2017 © Christian Barbé. Environment / The garbage of misery. The Andralanitra site, on the outskirts of Antananarivo, Madagascar’s capital, contains waste that accumulates on about 20 hectares. The sorting is done with bare hands by some 3000 ragpickers who visit the site daily. 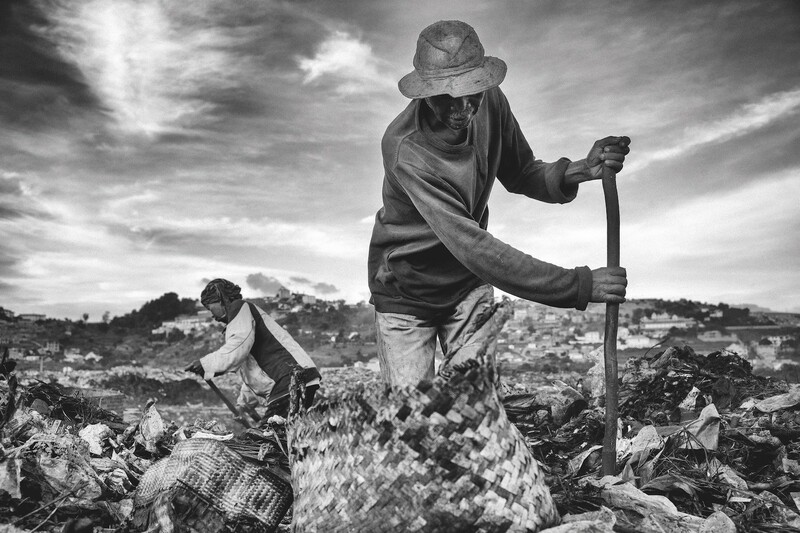 Each shot in the “The dumps of Andralanitra” series, taken by Christian Barbé in 2017, shares with us the obstinacy of men, women and children who dig through the rubbish and recover everything they can make money out of it to survive. Christian Barbé plays with subtlety with shadow and light effects to intensify the presence of his subjects, human and animal beings, on this cursed piece of land in Madagascar. 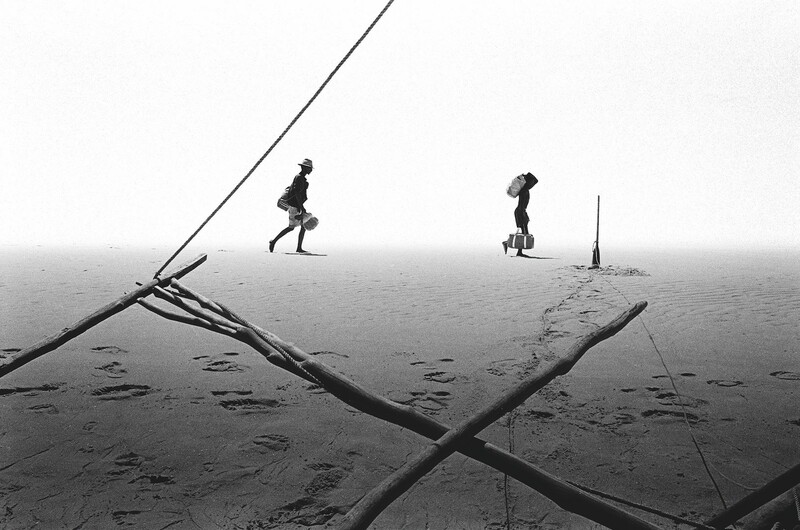 Born in Deauville (France) in 1970, Barbé works and lives between Madagascar and Paris. After studying philosophy, he learned the basics of photography in a professional development laboratory. He continued his apprenticeship in studios where he discovered the profession of reporter and began to link photography and reporting. In 2015, he was hired by the Malagasy daily La Tribune de Diego for which he produced photographic series, particularly on the asylums of Madagascar. © Philippe Gaubert. Environment.Man in echo with nature. Philippe Gaubert’s documentary photography goes well beyond the testimony. Indeed, in the two selected photographs nothing refers to the agreed images of Madagascar, the Great Island, lush and colourful. On the contrary, all exoticism and folklore are put at a distance, with black and white reinforcing this orientation. The artist’s objective is to make the viewer feel moving and empathetic about the proposed images. Bodies in motion are part of the immensity of nature. The human being’s links with the visible and invisible worlds are deep, unbreakable. Philippe Gaubert was born in Marseille (France). Engaged in a practice of auteur documentary photography for twenty-five years, the artist has carried out projects in the Indian Ocean, Africa, and Europe where his work has been presented in group or solo exhibitions. After training in Reunion Island with the BKL association (1990- 1993), he perfected his skills during an internship at the Magnum agency (1999), then followed courses at the Higher School of Art in Reunion Island. At the beginning of the 2000s, with the advent of digital technology, the artist integrated color into his approach. Philippe Gaubert deals with subjects not only as witnesses of changing societies, but also as vectors of aesthetics. Since 2011, he has been writing and directing creative documentary films. © Pierre Vanneste. Environment. The sea, an ecological and social game. Through the images of “Dremmwel” – ” horizon” in Breton -, the photo-journalist Pierre Vanneste draws attention to the dramatic consequences of the exploitation of the sea’s resources. This web documentary was produced between 2015 and 2018 in different European countries and Senegal. One of the two black and white photographs of “Dremmwel” selected by the Dapper Foundation leads us to the transformation site of “Pentium Sénégal”, in Thiaroy-sur-Mer. The work on the light reinforces the presence of the goat walking around near a huge quantity of fish put to dry on the ground. Pierre Vanneste is a Belgian photographer and director, graduated in photography from INRACI (Institut national de radioélectricité et cinématographie) in Brussels. He specializes in transmedia documentaries. As early as 2015, Pierre Vanneste begins a report on the exploitation of the world’s fisheries resources and its economic and social impact. In 2018, the artist co-authored the web documentary Bargny, here begins the emergence with Laurence Grun on the climatic effects of this commune located thirty kilometers from Dakar. © Jarmo Pikkujämsä. Environment. The sea, an ecological and social game. From year to year, the quantity of fish and shellfish is decreasing on the west coast of Africa. Jarmo Pikkujämsä photographed and collected testimonies from fishermen in the Guet Ndar district of Saint-Louis (Senegal) who, due to lack of sufficient catches, lose their jobs and their homes. 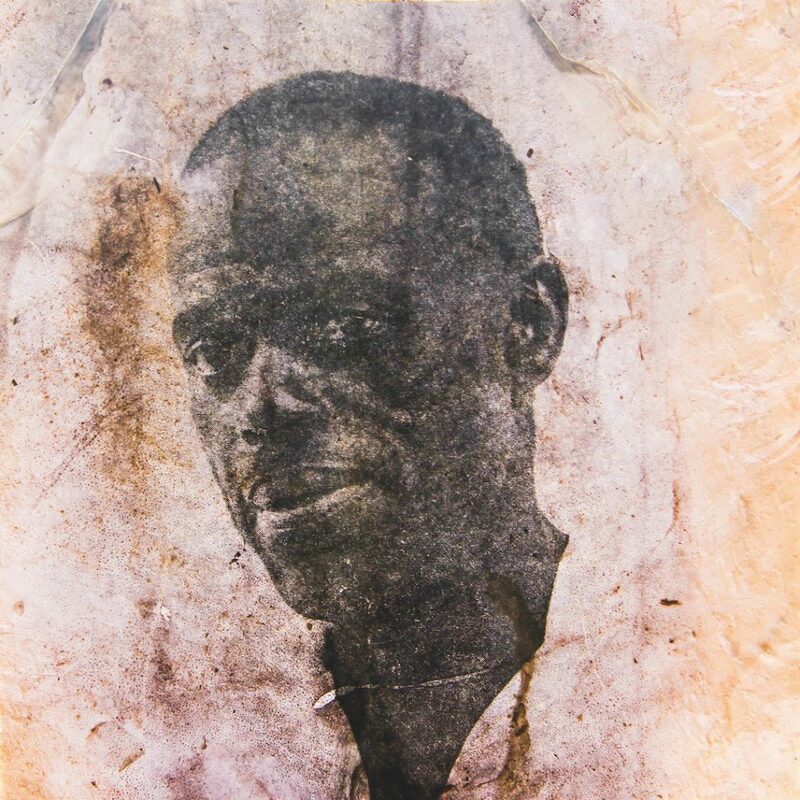 Through his portraits rendered on fish skins, the photographer subtly alerts us to the concrete consequences of the plundering of Africa’s oceans and climate change. 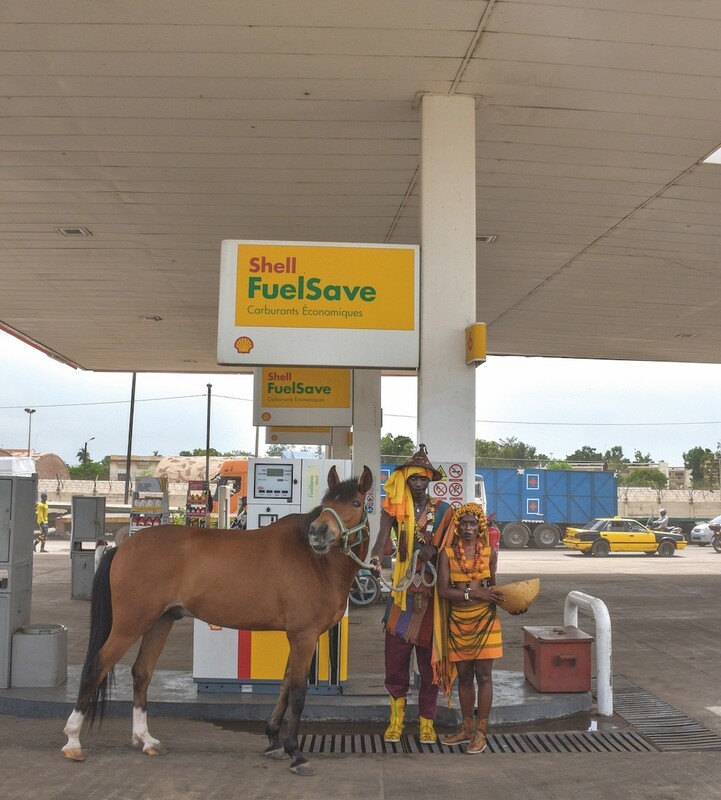 Beyond protecting natural resources, it is about preserving the well-being of local populations. Far from the traditional documentary reports, Jarmo Pikkujämsä suggests and moves us. Finnish visual artist and researcher Jarmo Pikkujämsä coordinates artistic projects within the WAAW artists’ residence in Saint-Louis (Senegal), as well as in mobile residences in Mauritania. He holds a DEA in French and comparative literary studies from the University of Paris-XIII (2003). Jarmo Pikkujämsä is looking for movement, rhythm and tranquility in his work. Passionate about cyanotype and underwater photography, he uses alternative processes by working on organic surfaces such as in his “Guet Ndaru Mool” series. For Man, nothing is self-evident. Whether it is a question of one’s destiny and human condition, one’s place in the face of the elements or cultural identity, everything is a source of questionings. “How do some people still manage to live their “traditions” when their environment requires them to adapt to Western models? ». Julie Robineau points out the harmful effects of globalization. In the photographs selected, she takes as an example the Fulani, an important group in Senegal although a minority. 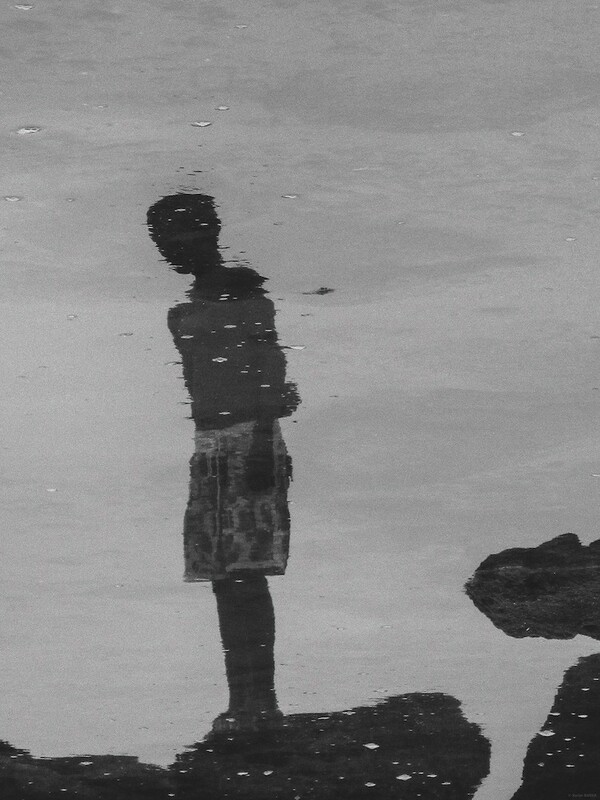 Through her photographic productions in various places in Dakar, the young artist defends a cause that is close to her heart. Born in France in 2001, Julie Robineau arrived in Dakar in 2012, in 6th grade. Having grown up with new technologies, she started by taking pictures with mobile phones. She is a photojournalist in the city of Dakar and at the same time takes photographs with staged scenes. The series entitled “MondialiSANCTION” was the ( not selected) project of a call for applications, in 2018, for the Circulations festival, whose theme was free. Living! is Julie Robineau’s first group exhibition. Karim Barka draws his characters with light. The photographic series “Water Nomad” (“Les Nomades de l’eau”) was created on the coast of Sidi Ifni, Morocco. By accentuating the contrasts of white and black, the photographer manages to produce a strong visual impact: the characters seem to be part of the underwater world. Mysterious, dreamlike, the atmosphere of “Water Nomad” invites us both to enter the food-providing Ocean, and to stay away from the shore, beyond which there are so many dangers. Is the shoreline a protection, a barrier or a place of passage for those who hope to find a better life in the distance? Karim Barka was born in 1990 in Tiznit (Morocco) where he studied applied arts in high school. In 2011, he continued his studies at the National Institute of Fine Arts in Tetouan; he graduated in 2015. Through different media – drawing, installation, photography and video – Karim Barka questions the multiple ways in which the body can be inscribed in time and space. Karim Barka has participated in several group exhibitions in Morocco and Senegal. 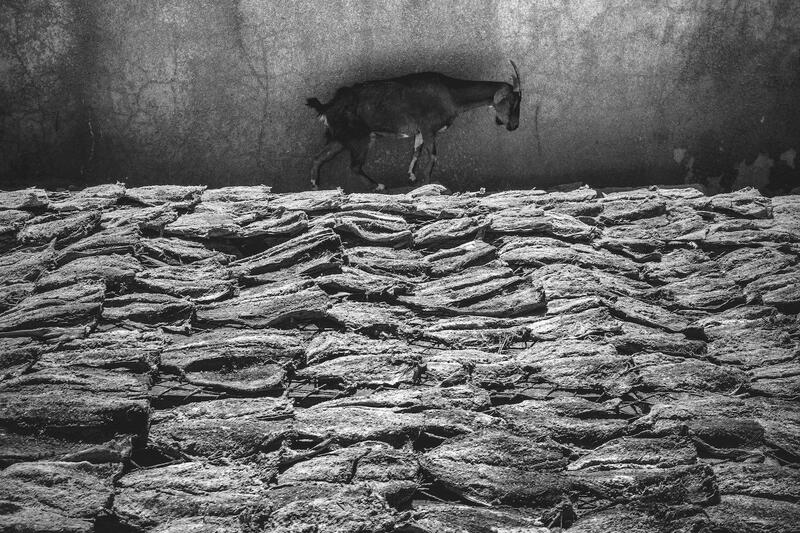 Ziad Naitaddi’s approach is, through his black and white photographs taken in Salé, Morocco, to “capture and go to the depths of the human soul”. Whether it is a portrait or distant and “live” shots, the photographer evokes the same deep emotion in the viewer who, for the duration of a shot, shares the mood of the people photographed. With his melancholic representation of the other with whom he identifies, Ziad Naitaddi makes us realize that man is, in a way, condemned to be alone in front of himself and life. Ziad Naitaddi was born in Rabat in 1995. 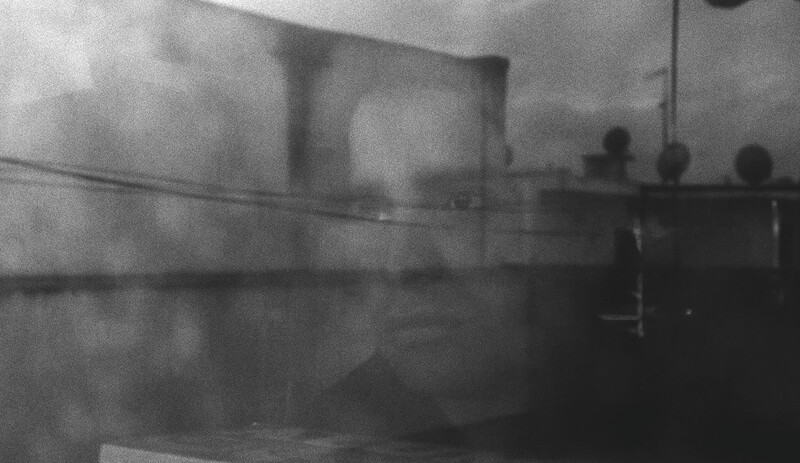 Since 2013, he has devoted himself to photography and cinema, which he explores in the form of fiction and documentary. In 2017, he was awarded the first prize of the jury of the festival Les Nuits Photographiques d’Essaouira. His photographs have been exhibited in Morocco, France, South Korea, Benin and Senegal. Passionate about cinema, his main motive is the human figure. Ziad Naitaddi explores the human soul and that of his country through different perspectives and multiple points of view. The migration issue is at the heart of the concerns of emerging countries, where youth and “brains” are fleeing. It is addressed here through those who leave and those who have arrived, but also those who remain. In his series “O’ndzia” (” The One From Elsewhere”), Saan deals with grief in African illegal immigration, through the story of a young man who survived to a tragic crossing, during which he lost a loved one. 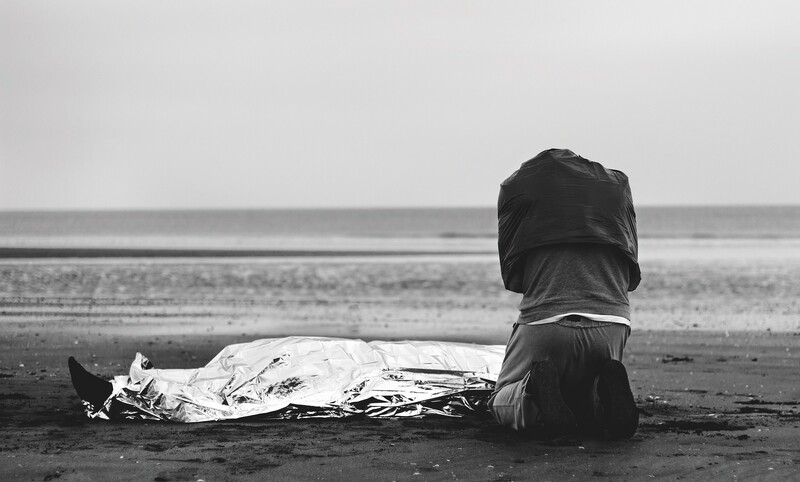 Every position, every element that makes up the photographs has been meticulously worked on and anticipated to send us back with horror to the world’s indifference to the tragic deaths of thousands of individuals. Saan’s clichés also remind us that this is not just another death: there was truly a man, a soul, before the tragic end. Sandrin Athele, known as “Saan”, was born in Gabon in 1986. He moved to France in 2004 where he obtained a master’s degree in computer linguistics. Self-taught photographer, he specializes in portraiture, black and white and photoreporting. Saan is passionate about cinema and fashion, two worlds that greatly influence his work. Through his series, the artist questions the human condition. Vivre! is his first group exhibition. Serie « Other worlds more than ever », 2018 © Moussa Kalapo. Exile. Those who stay. To denounce. To make people think and evolve. This is Moussa Kalapo’s goal with his series “Other Worlds More Than Ever”, which approaches immigration from a relatively atypical angle: those “who remain”. The photograph selected by the Dapper Foundation evokes the story of a young Bamako man whose aspirations and anxieties are shaped by this dream of an elsewhere omnipresent among the Malian youth. With an apparently simple staging, in reality full of symbols, Moussa Kalapo wants to encourage his compatriots to build and build themselves in their country, despite the vicissitudes. Moussa Kalapo was born in 1983 in Bamako, Mali. After studying accounting and computer science, he enrolled in 2010 at the Photography Training Centre (CFP) in Bamako. After two years of training, he became a reporter-photographer for non-governmental organizations (NGOs) and participated in workshops and group exhibitions in Mali and France. Moussa Kalapo also works for the digitization of the Malian photography archives (notably Malick Sidibé and Félix Diallo). Series « Between dream and reality », 2018 © Rolook. Exile. Destroying a myth. 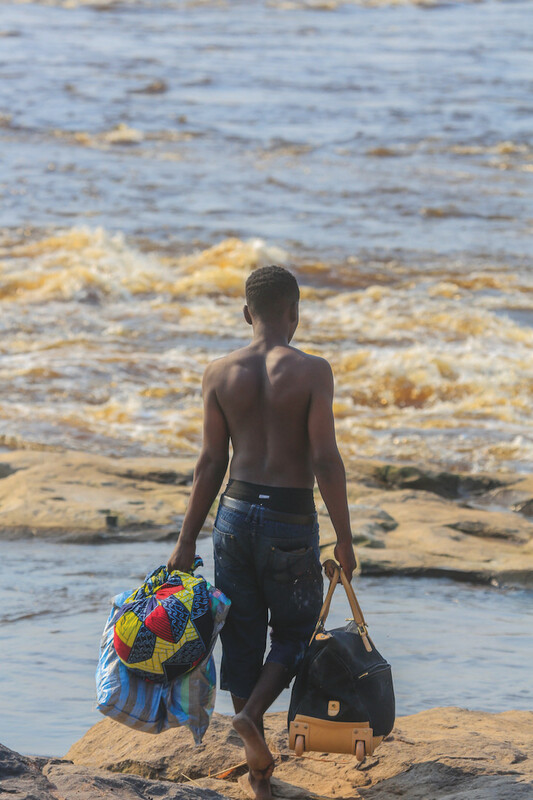 With his series “Between Dream and Reality”, Rolook takes to the stage in Kinshasa, on the banks of the Congo River, to challenge his own people and encourage them to reflect on their dreams from elsewhere and their – wrong – vision of Europe as an El Dorado so that they can evolve. With his back to the objective, a young migrant leaves his life behind him. Paradoxically, he carries very few personal belongings and leaves barefoot and bare-chested, underlining that he is not at all equipped for the journey and the possibly fatal hardships he is about to face. Romario Lukau, known as “Rolook”, was born in Kinshasa in 1994. He graduated from the Institute of Fine Arts in 2012 and then entered the Academy of Fine Arts where he graduated in 2015. Through his art, Rolook takes a critical look at politics and the media today. A particularly committed artist, he participates in the dissemination of contemporary Congolese artists. He is co-founder of the Tokeyi collective – “Move-on” – “Avançons”, in Lingala – which aims to promote art and culture in Kinshasa. With Aude Leveau and Christiane Falgayrettes-Leveau as curators, the photographs will be a thematic tour addressing social and environmental issues or evoking introspection, questioning and exile, in connection with Africa and its diasporas: a look at the world beyond borders.